There was more at stake in this year’s elections than U.S. congressional seats or governorships. In many states, Americans had a chance to weigh in on ballot measures about the voting process itself, including same-day and automatic voter registration, requiring photo IDs to vote, restoring convicted felons’ voting rights and voting absentee without needing a reason. Broadly, majorities of Americans supported the idea of several of these initiatives in a Pew Research Center survey conducted about a month before the election, although there were notable partisan divides on many of them. Here is what our survey found about Americans’ opinions on the ideas behind some of the voting-related policies that voters approved during midterm elections last week. Overall, about two-thirds (64%) of Americans strongly or somewhat favored the idea of same-day voter registration in our pre-election survey, but partisans were divided. Roughly eight-in-ten Democrats and Democratic-leaning independents (78%) favored allowing people to register on Election Day, compared with 49% of Republicans and Republican leaners. Automatically registering people to vote in certain situations also had public support. In Michigan, voters approved a wide-ranging constitutional amendment that would automatically register people when they obtain or renew a driver’s license or conduct other types of business with the secretary of state’s office. Nevada voters also approved a proposal to automatically register voters who apply for or request changes to an identification card or driver’s license at a Department of Motor Vehicles office. Prior to the midterm elections, 14 states and the District of Columbia had authorized automatic voter registration. 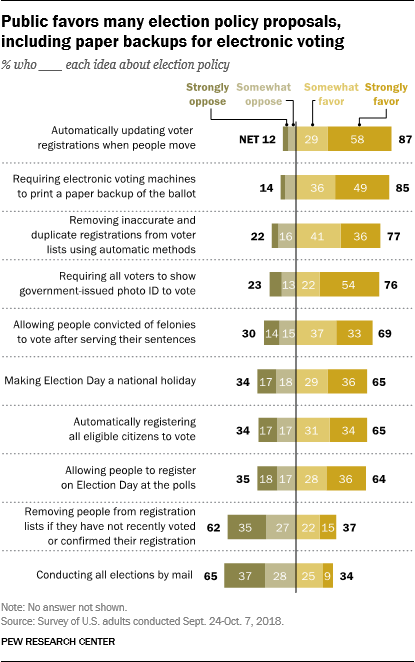 About two-thirds (65%) of the public supported the idea of automatically registering all eligible citizens to vote, while 87% said voter registrations should be updated automatically when people move. There was a large partisan split over automatically registering eligible citizens, with 78% of Democrats in favor compared with 49% of Republicans. Yet overwhelming majorities in both parties supported automatic registration updates when people move. There are certain registration-related policies that Republicans were more supportive of than Democrats. These include removing inaccurate and duplicate registrations from voter lists using automatic methods (85% of Republicans favored vs. 70% of Democrats), as well as removing people from registration lists if they have not recently voted or confirmed their registration (53% of Republicans favored vs. 24% of Democrats). Voters in Arkansas and North Carolina approved measures requiring people to show valid photo identification in order to cast ballots. Supporters have said the practice is a safeguard against voter fraud, while opponents have said it restricts access for legally eligible voters. As of earlier this year, 17 states had laws requesting or requiring some form of photo identification at the polls, according to NCSL. In our pre-election survey, around three-quarters of Americans (76%) favored requiring all voters to show government-issued photo identification to vote. The vast majority of Republicans (91%) backed ID requirements, while a smaller majority of Democrats (63%) said the same. Florida voters approved Amendment 4, which will allow most people convicted of felonies to have their voting rights restored upon finishing their prison, probation or parole sentences. (This excludes those convicted of murder or a felony sexual offense.) The amendment’s passage adds over a million potential voters to the rolls in Florida. 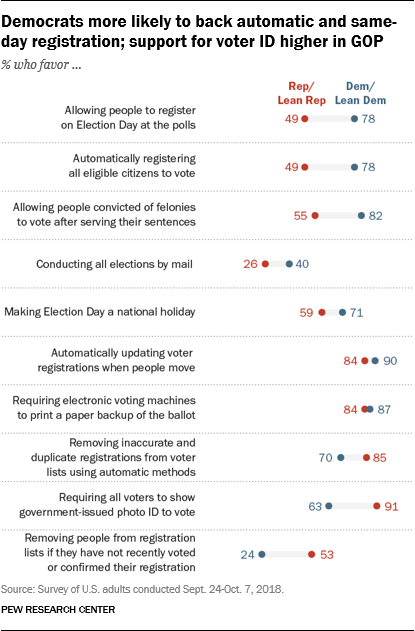 Nationwide, around seven-in-ten (69%) Americans favored granting voting access to those convicted of felonies after they serve their sentences. Though majorities in both parties backed this, Democrats (82%) were far more likely than Republicans (55%) to support allowing convicted felons to vote after completing their sentences. As part of Michigan’s constitutional amendment on voting access, voters in the state will be able to request absentee ballots without having to give a reason (as well as register to vote on Election Day and cast straight-ticket ballots). With these changes, Michigan joins 37 other states as well as the District of Columbia in having either early voting, voting by mail or no-excuse absentee voting. Overall, 71% of Americans said that any voter should have the option to vote early or absentee without having to document a reason, including 60% of those living in states that do not have early voting, no-excuse absentee voting or voting by mail. Three-quarters of those living in states that had such voting accommodations said any voter should have the option of voting early or absentee without needing a reason. As with some other attitudes, there are partisan differences: 83% of Democrats across the country think voters should be able to vote early or absentee without an excuse, compared with 57% of Republicans.